Page Master Designs Online: Runway Inspired Challenge--Thanks! It's FRIDAY!!! YAY! A weekend of rest and relaxation is just what I need. My back has gone out and creating is difficult. I am hoping to get better this weekend. On that note...this is a very short blog post. The new stencil from Simon Says Stamp really helped me out with this one. You can find the Stencil HERE. All the inks are either Hero Arts or Distress. Thanks stamp can be found HERE. The metal button (to play off the silver purse she is carrying) is an oldie from my stash. That's all. Off to ice. Have a Fabulous weekend. See you on MONDAY! 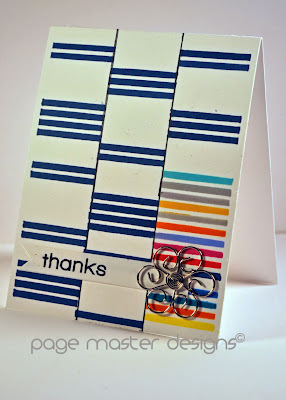 I lvoe the embellishment in the corner and how you stamped the stripes. it is very progressive! Love this! Very clever take on the inspiration! That metal button is adorable! Love that you create a background pattern with stripes, Michelle! Thank you for joining us on the Runway! And hope that you feel better soon! This is one original and fabulous creation! So glad that you join the fun with us at Runway Inspired Challenge!